Completing the Inner Loop road seal in the magnificent West MacDonnells is an excellent call by Chief Minster Adam Giles. And now, perhaps should we drop the sealing of the ever delayed Mereenie Loop to King’s Canyon and the Ayers Rock Resort. [b] Keep going straight ahead and disappear into the Never Never of the Ayers Rock Resort. This has been a no-brainer ever since the tail began to wag the dog and Uluru, rather than enhancing the tourism industry of Alice Springs, proceeded to steal its clientele. The resort has been in interstate hands for many years. It is now owned by the Indigenous Land Corporation (ILC) which has properties and businesses around the nation. The resort’s owners were evasive when we asked them how much of their supplies, in value, are sourced from Alice Springs. Logic would suggest that they come largely from Adelaide. Local employment at the resort is still very low. For decades the Indigenous population around The Rock preferred getting its income mostly from passive welfare, which makes the controversial $300m investment by the ILC even more of a puzzle. Let’s face it, Yulara – did you even know that is its name? – has never developed into a township. It is simply a resort. Resorts like it quite often have to look after themselves, yet the Ayers Rock Resort is generously supported by the Territory taxpayer with water, power and sewage utilities at standard rates, an airport, police, a school and a health centre. 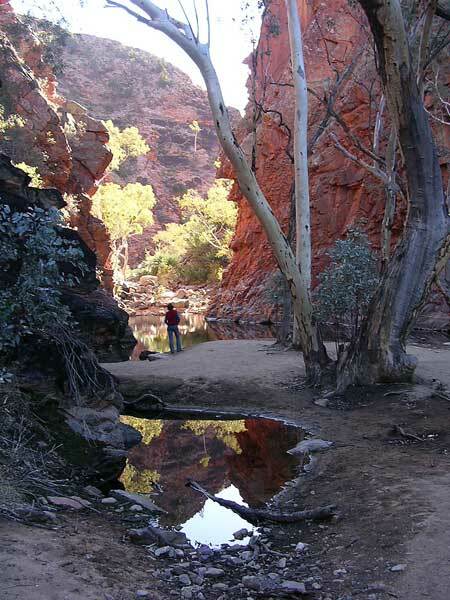 Does that generosity really need to extend to massive promotion by Tourism NT – to the disadvantage of Alice Springs? Some of that promotion money could well go to improving the East and West Macs facilities. For example, while you will soon be able to “do” the Inner Loop in a cheap 2WD, you still need a 4WD to traverse the five kilometers from the sealed road into Gosses Bluff. Ditto the John Hayes Rockhole in the East Macs. The notion of cutting loose the Ayers Rock Resort is getting around – hinted at by no less than Daniel Davis, vice-president of the CLP. It’s a discussion we need to have. Footnote: Google the distance from Hermannsburg to Glen Helen. Here is what you get: 749.71 km straight distance; 1,114 km driving distance; driving time 11 hours 5 mins. OK. It’s the Hermannsburg just south of Hamburg in Germany and the Glen Helen just east of Nottingham in the UK. Maybe you need to add “330 days of sunshine a year” or “zero pollution” or “best star sky in the world” to the search. Really, are we still having this discussion? The sealing of the Mereenie loop should not be put back again. Is everyone still only looking as far as their one tank of fuel takes them and what only effects them? Surely people have been reading about the upgrade of the great central highway and the Outback Way. All the traffic will be travelling along this route for some time to come. This traffic comming from the west would go around the Mereenie to Alice Springs via the West Macs. Traffic also travelling from south would continue around as well, instead of going in and out of Watarrka, then into Alice, possibly not haveing any more time to go out to the West Macs before continuing north. With good statistics being collected this may even be able to be confirmed from the tourist industry already or from traffic counters on all these road. We still need to consider the other industries using this route as well, why should all the locals have to put up with bad roads so a few weekend four wheel drivers can go out and roll the new four wheel drives. So we should be looking at this as a way to direct travellers into Alice Springs and not the other way around as everyone seems to think you don’t see pictures of Alice Springs all around the world but you do see the big red rock everywhere, so maybe this needs to be considered a bit more. Wasn’t Yulara a town once but is was such a badly mismanaged one it was decided to turn it in to a resort to rectify this. Couldn’t agree more Erwin. Forget the Mereenie Loop seal! Many people bring their 4WD vehicles here to find rough roads! Keep Mereenie Loop as it is! For the average tourist with a 2WD hire car allow them a real one day to one week long experience. Do the job properly and seal into the highlights like Redbank Gorge and Tnornala with facilities like those at Ellery Big Hole. All with TOs’ consent. Even some jobs for those ‘work ready’. A camp in desert oak country back on Larapinta Dr. would be a fine addition too. Plenty of nearby outstations for workers! Yes, building an easy escape to Yulara is simply folly. As you say they contribute little to our Alice economy. It would appear the opposite. Tour companies can continue to offer the full package deal. Concede that Watarrka is the real loser. However their model is built on the current unsealed road.